I’ve been leafing my way through a local culinary magazine whose subject for this particular issue is “Street Food.” And I’m a little confused because every place mentioned is either a storefront or restaurant, not a place where eat food on the street. I kept digging and digging, turning the pages, looking for some stories about people actually serving street food—on an actual street. But there’s no food camionnettes driving around, dispensing goodies in Paris, and I get a little dewy-eyed when I read about all the interesting food trucks elsewhere doing everything from frying up oyster sandwiches to dipping swirls of ice cream in crazy toppings, and wish one would pull up to my front door and make me a fancy grilled cheese sandwich with Comté or croque monsieur in a pain Poilâne wrap. And I’m not the only one. French chef Thierry Marx is quoted as saying, “Set up the best gnocchi à la Parisienne next to a Quick and a McDonald’s and you’ll drag all their surplus.” Am not sure if he meant that if you open a food fast-food alternative in front of a fast-food spot you’ll cut into their business, or just take up the surplus of people waiting in the disconcertingly long lines at McDonald’s in Paris. Okay, it’s not a croque monsieur, but it’s a pretty neat idea. Getting out of Paris, if you drive through the French countryside, though, you’ll often pass trucks parked on the side of the road selling food like bread, pizza, or some version of le snack. And if you ever see a camionnette blanche parked alongside of the road, with candles on the dashboard and either a battered little Renault or Citroën parked just beside it, you’ll find women also selling something else, as well. But although food trucks aren’t exactly clogging the boulevards of Paris, there is a version of a food truck in France that’s pretty great (and no, I’m not talking about les camionnettes blanches) … and that’s the rôtisserie. Go to any outdoor market and there will invariably be someone spit-roasting meats of some sort. And I seem to always dial in on the poulet rôti, the roast chicken. I actually stopped buying fresh chicken to roast at home because they do a better job with their glowing-hot ovens than my puny little four à maison can do. The one problem I found, though, is that if I buy a roast chicken at my market, the moment I get home I rip open the waxy paper sack and just start picking away at the meat and skin. At the market in the Bastille, Catherine makes poulet crapaudine, a spatchcocked chicken that’s been marinated for a couple of days, then spiced and salted and roasted until the skin is extra, extra-crispy. It’s so crispy that the skin stands up to the extended period between when she slides the chicken in the bag, seals the top shut, and I open it up in my apartment fifteen minutes later. For a while, I stopped buying them because I would eat the whole thing by myself, in one sitting. It was awful. Actually I should say “In one standing” because come Sunday afternoon, there I would be, standing at my kitchen counter over a cutting board, attacking the roast chicken, picking out all the juicy morsels of warm, salty meat with my fingers and shoving them in my mouth. And then there’s the skin. Chicken skin is one of those things that isn’t very good for you. Like pork belly or white chocolate, there’s not a lot of nutritional value in there. Just a lot of fat – and a pretty good amount of salt. But that’s me, digging my greasy fingers in like a drug addict, ripping off every bit of skin, saying that I’ll stop after one more piece but hopelessly unable to quit until I’ve picked the meat, skin, and bones of the poor bird clean. This weekend was a very big event for me. We got to the market late and many of the vendors were in the process of cleaning up. Most were tired from working since 4am (which goes against the common perception that the French don’t work hard), and we stopped to watch the last of the chickens being slid off the spit. She dropped one of the hot chickens in a bag, handed it over to us, and said it was a cadeau because, “Vous êtes a-dor-able.” I think she meant that compliment for Romain, but if it meant poulet crapaudine (which roughly translates to “bullfrog”-ugly chicken) for me, I was willing to take one for the team and be the ugly duckling. One day I’m going to move to a new neighborhood, and have to go through what’s called the bizutage, or “hazing” one has to go through until everyone gets to know you. 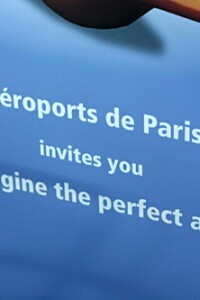 Am not sure where I’ll end up in Paris next. I’m sure there will be a market of some sorts, as there is in every neighborhood. But I doubt I’ll find roast chicken as good as this. Unless she decides to go mobile. That roast chicken really looks pretty awesome. Thanks for sharing a slice of Parisian life (and food) with us. :) have a great week ahead! Poulet roti really is one of the joys of France. My husband usually doesn’t like to get chicken from the market because the dark meat isn’t well done enough for him but I bet this chicken would do the trick. I tried some Paella once from a market but didn’t like it much because the tentacles from the shrimp were everywhere. I do love the potates you can get that sit under the chickens as they cook, especially if they add seasonings. Going to Sunday markets is a great way to get a meal together with no effort at all. That chicken looks delicious! I love a rotisserie chicken basted with butter and paprika and all crispy and delicious. I’ll admit I’m not a big skin lover but the mister happily eats my share. Sadly, the only food trucks I’ve seen in France themselves basically sell chips. And sausages, burgers, etc. Edible for a quick lunch, especially if you just get a sandwich, but not exactly healthy or particularly delicious. Mind you, I’ve seen market stalls that sell you hot food – tartiflette, the ubiquitous roast chicken (arguably not as nice as yours? ), sometimes other things – but very seldom eaten from them. Here, in my part of South London, there is a wonderful van that sells Caribbean food, based round a roti, or flatbread, topped with deliciousnesses like curry goat, or curry mutton, or a pumpkin mixture that is totally vegan. Awesome! 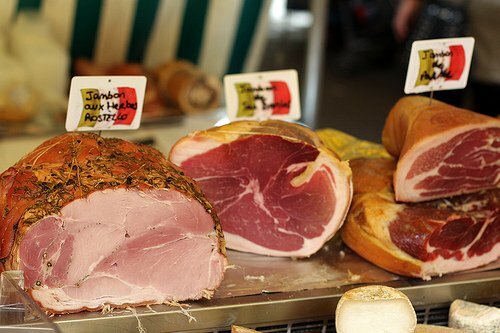 When you come to London for a booksigning, you’ll have to come to the foodie heaven that is Brixton Market these days! Here in Nantes we have one and only one hotdog stand. Unfortunately, like most French versions of North American food, they’ve managed to get the letter while completely missing the spirit. The hotdogs are steamed(and not very good), as are the buns, and there’s only ketchup and mustard as toppings. I do like market roasted chicken, and I’m a big fan of market bbq eel too. Annabel and Phil: It’s interesting how some foods (like the paella, shown) from other places have been co-opted, while others haven’t been. But since I’ve been here, I’ve seen a radical shift in how other cuisines are being taken more seriously (mostly Mexican and Japanese) so it’ll be interesting to see what happens in the future. A magazine filled with articles about street food is a start – the French have had “trucks” serving food, so perhaps eventually they’re expand their offerings and their reach in the future. Oh, my God. I just saw you have an app?!? YOU HAVE AN APP!!!! We have trucks like that at every street market in Italy too. 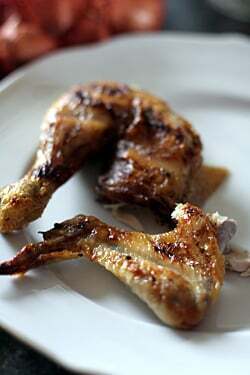 I love roast chicken and seriously: what is the point of eating roast chicken if you are not going to eat the skin? I drives me insane when I roast a chicken and people leave the skin on their plate. Yum. I know what I’m having for dinner tonight. 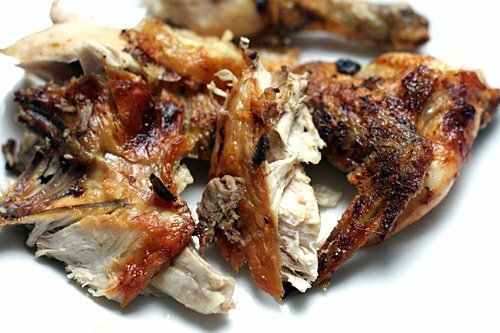 Crisp chicken skin is not high in fat because most of the fat has been rendered out particularly if the attached bird has been cooked on a rotisserie. The scientists who do these analyses do it on raw chickens then assume that the fat remains on the chicken until you eat it. Many of those mobile rotisseries have large tanks for the waste grease. Perhaps they should just put the grease straight into the diesel tank. Great post! Thanks David for being so gracious yesterday when we spotted you at the market and couldn’t resist the urge to bother you for a few minutes. 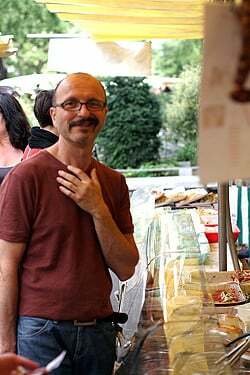 After reading your books, and following your blog / tweets/youtube interviews for a long time,… there you were, just standing there at le marche de la Bastille. We are still marveling about the “small world” phenomena. Definitely a fun moment for us on our Paris vacation! As for the chicken, grace a vous we found the Chicken Lady and consequently enjoyed what we would say without reservation was the BEST chicken we’ve ever tasted. You surely captured the deliciousness in that photo, wow! Oh, such a good post! Your writing is dreamy. I love reading about life in Paris and you always make me hungry. 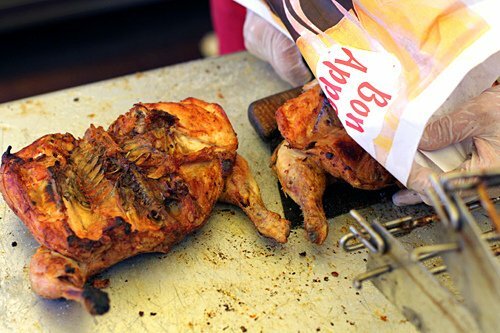 Our butcher does roti chicken a couple of times a week so we don’t have to wait for market day to roll around. His chickens are always wonderful even if he doesn’t do those amazing little potatoes at the bottom. I can’t wait to get back there for my regular Sunday chicken. Kathryn: For some reason, I’m not so wild about the potatoes. Even though I know they’re basted in chicken juices (and, um, fat..) they’re those potatoes that come in cryovac packages and don’t taste as good as real, roasted potatoes to me. I often opt to get some roasted beets from another vendor and toss them in horseradish or shallot vinaigrette. Linda: Thanks for saying hi! I’m not at my best in the morning (ok…it was around 1pm…) but as you can imagine, it’s hard having one of those hot chickens in a sack and not racing home to open it. Hope you had a nice time at the market and glad you like the chicken as much as I do. Stephen: Similar thoughts go through my mind when I’m eating all the skin. I think, “Just a little can’t be bad for me..” Then, of course, I eat the whole thing. Thanks for the link to the article. It would be interesting if someone wrote something similar about the food trucks in France today. (That’s what I thought the magazine articles I was reading would be about.) But I’m sure out in the Provinces, there’s some interesting ones that sell more than pizza and chicken..
Last year we made it to the Sunday market and specifically went to buy chicken from the Chicken Lady – what a treasure and what tasty chicken. This year that is the first thing on our list in Paris – and we have told other traveling friends about her. Thank you thank you for mentioning her! Yum! I feel like poulet roti often takes a backseat to all of the other delicious French foods. Whenever we are in France, I always order it while the hubby orders a croque monsieur. We were actually just talking about what makes the roast chicken in France just so much better than in the States. After reading this, now I know that they are marinated for days at a time. Must try! Yes disconcerting to see the long lines at McDo but also so sad for France. I wrote about it a while back. Americans are always surprised to hear this. – who’s the biggest consumer of McDonald’s behind the U.S.? France. – which country has the biggest opening number of new restaurants behind the U.S.? France. – which country saw its profits increase the most between 2004 and 2008 behind the U.S.? France. – which European country has become a key and the largest market for McDonald’s? France. Oh yeah! Roasted chicken…such a simple pleasure. The potatoes. Most people don’t realize that they are canned. You can taste it. The fat. Actually it’s the most nutritious part of the chicken. With the breast meat being the least. The salt. There is nothing wrong with it. Studies have shown that the link between hypertension and salt is unfounded. David, I love your ideas for street food–fried oyster sandwiches, duck confit tacos, grilled cheese with comte. If it didn’t involve so much paperwork (and you weren’t so busy already) I would suggest you get your own food truck! I laughed SO hard about you standing up and devouring the whole chicken at once, unable to stop! Because that is EXACTLY what happened to us on our family vacation in Paris this spring — the street vendor’s chicken was so amazing, crispy skin and all, that we consumed it right from the bird, no plates, just bad manners and grabbing. Even alone in our hotel room, we felt embarrassed. Long live poulet roti, especially bought on the street! 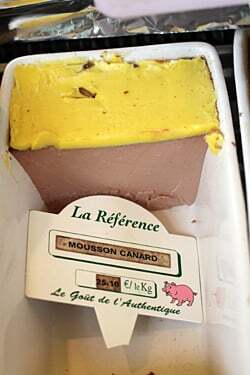 I remember years ago, when I was in Normandy in a town called Barfleur where my sister in law comes from, on a sunday, seeing different meats turning on a roti beside the harbour. The idea was that you chose and paid for your roast and then went to Sunday mass and when you came out your meat was cooked, which you took home with some of the gravy (fat) that had accumulated in the bottom of the grill. To this day I can remember how delicious that piece of roast lamb was and how perfectly cooked it was! Does anyone know if the roitsserie chicken in France is the same as the stuff we get in our stateside grocery stores? I’m always craving a nice roasted chiken but just can’t stand the grocery store rotisserie chix. The taste & texture just don’t cut it for me. David, I was turned on to your blog by a Foodie friend from Seattle but at heart I don’t think she is serious about it. I imagine she has guilt and don’s her bib overalls a dowdy teashirt and eats brown rice and tofu for penance. This morning reading your roast chicken post I could smell the crisp skin and I looked around to see if anyone else smelled it too. Lulu my Jack Russell I think did at least she woke up and sniffed. Ah, France where the food police haven’t been sucessful the way they have here in the States fat removed from everything, carbohydrates are evil, sugar was invented by the devil. I sometimes wonder what the food police look like and in my mind I see something resembling the flying monkeys from the wizard of Oz with their calorie counters, fat grams calculators tucked under an arm. Keep up the good stuff. I expect to be in Paris in December for my birthday and I can eat again to my hearts content. 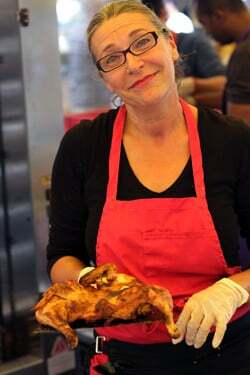 I miss the Chicken Lady! I loved the potatoes! We had friends from the States visit us while we were living in the 11th. They were so enthralled with the chicken & potatoes that they went home and recreated the whole thing on their outdoor rotisserie. The rotisserie chickens you get in the grocery stores here in the states–yuck! Not to be indelicate, but eventually you realize you’ve been eating antibiotics. If some organic chicken farmer would set up one of these roasters with potatoes anywhere in the US, they would make a killing. Maybe they have such a thing on the east or west coasts here? We live kinda in the middle. 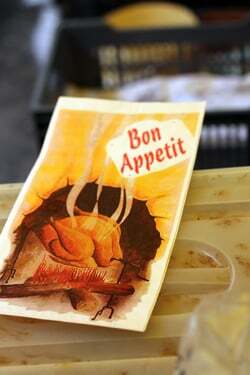 Angela in Provence: One thing that I learned a few years ago and that’s for American Thanksgiving, you have to pre-order a whole turkey (as you know, they sell very little whole turkeys in France). But if you get one at the market, they’re cook it for you! Which is a boon for those with tiny Parisian kitchens. Am so glad you posted about this, poulet roti is like crack to me. Oh, David, you have brought back some delicious memories of going to the Saturday Market in Beaune many, many years ago. We purchased chicken, duck and pork from the rotisserie, some wonderful cheese,fruit, a baguette and a few bottles of wine. We went back to our hotel to eat in the courtyard. When the Concierge saw us, he sent out someone from the kitchen with beautiful pink linens, china and wine glasses for us. It is these experiences that alway make me wonder when people tell me about horrible experiences in France. Never, never in my many visits have I had a rude moment except from the American at the TWA (told you it was a long time ago) counter at the airport. Oh David, another sad thing about Paris v. the south of France: here in the south we have always been filled with pizza vans, so the writer you mention may be correct. There is usually one in almost every village. And they do a great business here in mine. OK, so at lunch they have sandwiches and chips too, but they do a great pizza, and in high season DELIVER! 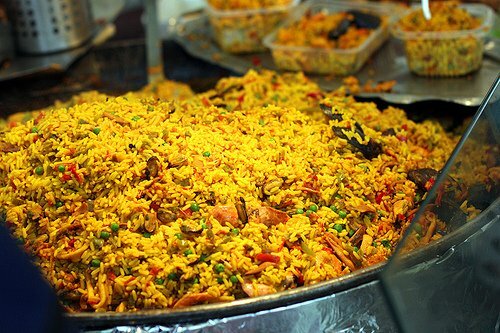 — they also have a roti chicken and paella stand outside one of my supermarkets. And there are small vans on all the roads to the beach — M Poulet, Poulet BBQ etc — You need a summer place (don’t all Parisians– or their parents– have one?). Then you could spend a few months enjoying the good life in provincial France, and fortify yourself for the months in Paris. It is so nice to see Romain! To Frenchie and the Yankee, among others – the French have always loved McDonald’s. The first one opened just off the Champs-Elysées in 1973 or 1974, when I was living in Paris, and was always incredibly popular. I used to go then, as it was different and strange – a Big Mac and a Milkshake weren’t food I’d ever come across before. McDonald’s didn’t come to London until around 1975 or 1976, and were a relatively expensive lunch in those days; somehow their prices haven’t changed much over the years! But I am saddened every time I return to France by how much the French have taken, in the past 40 years, to chain restaurants, far more than we have in the UK. Not just McDo’s and Quick, but places like Hippopotamus, Courtepaille, Buffalo Grill, all ubiquitous! When are you going to post a recipe for croque monsieur? Oh my goodness that chicken looks fantastic. I am a roast chicken glutton as well, and identify with your guilty love of chicken skin. 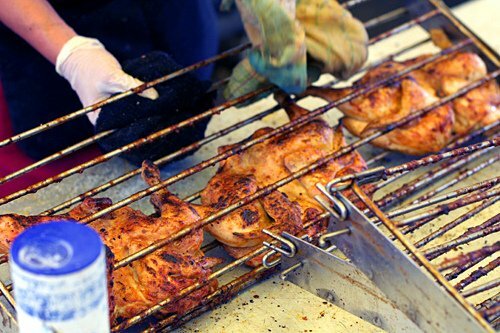 In Montreal, where I live, the tastiest birds come from our plethora or Portuguese rotisseries, and you lick the salt off your fingers for days. great post. and i can attest to pizza trucks in aix en provence in 1978.
actually just thinking the other day that the french DID invent food trucks with the camionettes that always show up at the markets or show up solo in remote villages. great post and p.s. there was more chicken eating done on the st. in a-i-p back in those days than pizza. nothing better than poulet roti! I remember those chickens well, David. But you haven’t mentioned the best part: get the vendor to scoop some of the potatoes roasting in the bottom of the rotisserie and – especially – a few scoops of the “jus” that is down there. Gorgeous potatoes and when you add the juice and the chicken carcass to a pot of simmering water, you have the most savoury, flavourful stock known to man. Reminds me of our stay in Beaune, Burgundy. The Saturday morning market was incredible! The first thing we encountered were those trucks with chicken and meats roasting on the side of the trucks. Kind of like the trucks you see here that haul glass with a-frame sides, but they were roasting meats and poultry on rotisseries. The smell permeated the market with delicious scents. 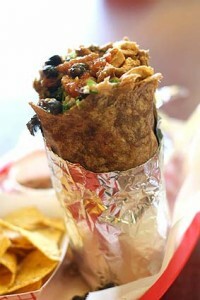 Thinking about it makes my mouth water! 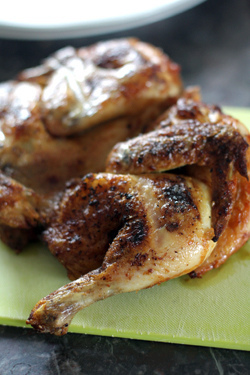 There is nothing better than the crisp skin of a roast chicken- and I don’t care if it’s good for you! :) It’s simply good. When I roast a chicken at home the husband and I have the customary moment of picking the crispy skin as we stand in the kitchen. Once that’s done he carves the bird and we eat at the table. Hands down, the best rotisserie chicken is from a hole in the wall kind of place in Santa Eulalia , Ibiza. They are so popular, one has to order 24 hours in advance. The chicken is cut into portions and comes with chips, not potatoes. Delish! For those who adore those tiny potatoes sitting in a bath of hot fat under the rotisserie – be aware that blood laden juices oozing out of the roasting chickens drip down on those potatoes! I love those potatoes too, but when I get home, I would placed them in the oven or microwave to heat it up just in case! Mind you, these potatoes are not inexpensive, which makes me think they may not be canned, depending on which vendor. Since you are single-handedly responsible for at least 9 out of every 10 chickens she sells to English-speakers I would hope you’re due a cadeau or two. I still remember the one we had. David, thanks for the photos of this splendor. Here in Southern California I oven roast a small kosher chicken almost every single Sunday. I always butterfly this bird, but I have been butterflying it by cutting away the backbone (which I reserve, cook-up in a pan and use the juices from to make a sauce and give the cat a little treat); this was what I thought spatchcock was. In your pictures it looks like Catherine is butterflying her bird along the breastbone line instead. I am thinking that this may be adding to the magic of her bird. She also is probably spared having pounds of pointless chicken spines to dispose of, but I also think that all of the nice flavors and juices from the complex (and juicy!) spine area of the bird may be helping to keep her birds juicy. In any case I am going to try this. Do you have any idea what she is marinating the chickens in? Street food in France. Why is there so little? Because food is too important to grab and scoff!! A native friend would drive from central Paris to Creteil (no small distance at the lunch time rush) cook herself a meal, relax, then drive back to work until 7pm. Every day. Anyway, there is loads of quick, ready prepared food, any epicerie, or charcuterie and many boulangerie have a range of stuff to buy that can be sooo good. The French have traditionally given the respect that decent food deserves, sit down, take your time, savour and enjoy. Its what I like about the place. Paris, like most capital cities, increasingly evolves to be different from the rest of the country. The increased pace demanded, more and more tourists who have little idea of the cultural history of where they are. Market forces dictate the changes, and of course, kids who deny their own hertiage because they think its cool. I guess you don’t go camping much David? Every campsite I have ever been on is visited at least once a week by the veritable Pizza Van. Fond memories of the wood fired pizza oven, producing beautiful charred base on proper thin pizza. Oh and the chicken is good. What is so surprising is how high the general standard is, north south, east west never had lest than acceptable almost always good, often exceptional, can live with the spuds as its so easy to do your own, buy a kg of charlotte or ratte or pink fir quick wash and boil and herbs and that delicious coarse salted butter – all done while you open the bottle of wine, tear up the fowl and plate up. Thanks for the blog – shame you weren’t doing it when I had to take groups of kids round the sights and try to keep them entertained and too exhausted to do anything other than sleep (in their own beds) at night! Our chef, Thierry, offers the best of both worlds here for us in the Dordogne. He drives his truck to us and we can watch as he prepares then enjoy as he serves up some of the best paella, brochettes de dinde and poulet roti anywhere. We’ve improved upon his regular poulet roti by asking him to serve it on a bed of lettuce with warm lardons and cubed boiled potatoes with a light vinaigrette. One woman said that every night that she was with us, she dreamed that when she got back home to Portland, Oregon, there would be a man, in a truck, waiting to cook dinner for her! I think the term ‘crapaudine’ refers to something flattened out, although I’ve heard it’s because it’s “Bullfrog-ugly”, although perhaps it’s one of the terms that defies an accurate translation. (It’s not in my Larousse dictionary, with over 120,000 words.) There are crapaudine beets, which aren’t round but longer and more shriveled. Clotilde wrote about crapaudine beets a while back, too. I got that roasted chicken you always write about in that market and started eating it immediately. It was impossible to do otherwise – the aromas were too much for me. Besides eating clandestinely in France is fun. Perhaps the reason there are no food trucks is because it’s difficult if not impossible to start any kind of enterpreneuial(sp) enterprise in France or so I’ve been told..
NY has TONS of charming food trucks – recently the city decided to enact an old law that trucks are taking up valuable parking space and demanded they move – really annoying of the city. 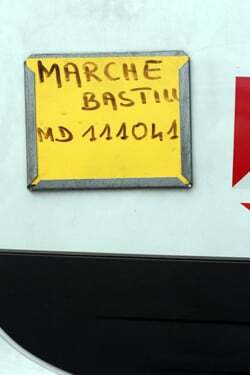 “your” marche is “mine” too, at least twice a year as I rent an appartment on an off street from Rue de la Roquette. Though there are two rotisseries on Sundays marche, I chose the one you mentioned, because it has a wider choice. I ususally take rabbit, or the duck if they have one, because we got plennty of rotisserie chickens in Israel but no rabbit and very few ducks. I saw the crapaudine- I’ll try it next time, I was afraid it will be too dry. I trust your reccommendations. As for the paella, I decided not to try it – I don’t know why- it just didn’t look right. When in the market shopping for cheese to bring back to Tel Aviv , I wondered if you have a preferate fromager . Finally I just bought from different ones, not being able to decide which one is better. I had the luck to catch the last days of the white thick asparagus, quite expensive but what a treat! whith a light home made bechamel sauce , it was a perfect first course to my rotisserie rabbit entree ,with big plump cherries and sweet apricots for desert – only after a small piece of beaufort cheese with baguette complete from the Tradition Boulangerie in the corner of la Roquette and a Rue … you sure know. Can’t wait to be back at the Sunday marche. Any reccomendations for the best places to shop there are welcome. I tend to buy cheese from the folks from brie with all the brie de Meaux cheeses, and vegetables from the stand next to theirs. 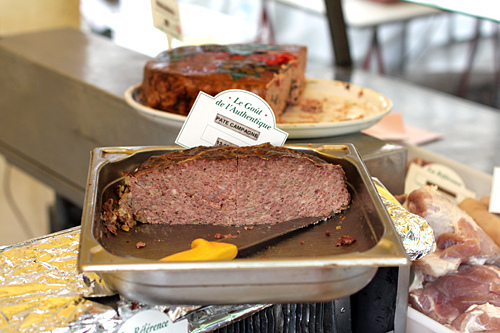 On Sunday, I buy sausage and Cantal from the young man from the Auvergne because they’re so great. I agree with Nick — the French would find it uncivilized to eat on the street standing up, walking or taking back to their desks to eat street food this is the American way! Food trucks are the HOT things lately in Charlotte, NC where I live and everywhere else. Street food is very common in Turkey (and I am sure other Middle Eastern countries) and my observation that mostly immigrants started street food in America. (Taco Trucks in LA was the first I could remember). So you think immigrants would be a big part of the street food in France as well (if it was not for the 2 year red tape ordeal!) ? Local council regulations mean that food trucks have yet to hit the streets here in South Australia, too. God only knows how long it will take to sort out the regs. As a fellow chicken skin addict, you have my complete understanding – no matter how good my intentions, the skin always finds it’s way to me first. Enjoy your blog tremendously. So, when are you going to do a write-up on Romain? awesome looking roasts! 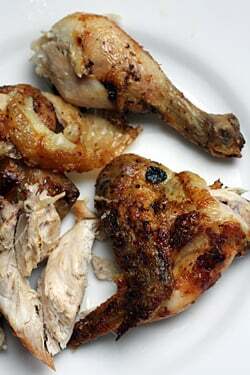 My love this summer has been chicken slowly cooked over coals till the insides are juicy and the skin crispy. I cant decide between american BBQ sauce or the simpler marinades. Thanks for your humor, insights and recommendations (in both book and blogs). Taking your recommendation we did make a point to shop with the Chicken Lady on our very recent visit to Paris – – outstanding chicken and loved her great smile. Thanks to your guidance, we also sought to mind our French manners (at least most of the time). Merci ! Yum!! Looks so much better than the Purdue we had tonight from BJ’s. I grew up a mere block from Lobel’s Butcher in Manhattan and a very few times my mother would splurge and buy one of their rotisserie chickens and we would get home, tear open the bag and pick it apart skin and all just as you described. As a matter of fact, right next door to Lobel’s was Greenberg’s cookies, now a full on bakery, that sold the most fabulous cookies- butterscotch or something. They were crazy expensive and only rarely would my mother indulge me. She instead encouraged me to start baking my own, and that is exactly how I began all of my baking and dessert making! So funnily enough, tonight we had our BJ’s chicken and I made the great Oatmeal raisin cookies from one of your older postings, and the cookies were fabulous. I once watched a documentary on peking duck. This post produced the same reaction. Carnivorous salivation. When chicken is finger-licking lip smacking good, it just is. It’s been a rare occasion for me but I really enjoyed reading this post (I’m a new reader/follower). This post and the photos are mouthwatering. Just so I’m sure, is this the Marché de la Bastille, Saint Ambroise, Boulevard Richard Lenoir, 75011 Paris? Ben: Yes, as mentioned in the post, it’s the market in the Bastille (I also tagged it at the end ‘Bastille’ and ‘Richard Lenoir’). Her stand is there both days but she only make the crapaudine chickens on Sundays – and usually there is another fellow minding the stand on Thursday. Fried chicken skin is my fav part of the chicken!! And the rice stuff looks like biryani..is it?? One of my favorite memories of my travels to France with my late partner,who was a french teacher,were those incredible roast chickens.One time there was a poulet roti cart on the street in Montmartre below the apartment we were renting and the chicken fat and drippings cooked and flavored small potatoes and garlic resting below the roasting bird;when you bought the chicken you got the garlic and potatoes too … OMG it was so good!! One time I saw the monsieur who owned that cart dump about a gallon of chicken drippings and fat down the street drain in front of his cart!!! All I could think was what great soup that would have made. I think my favorite dessert of yours,of the many I have tried, are the Choc. Mint Brownies. Mmm, rotisserie chicken. Looks divine. The supermarket ones here in New Zealand smell a lot better than they taste, but luckily we now have a food store who does free range ones, and they are delicious. OMG, I’d forgotten all about Minitel! How French was that? I just almost ate a whole half chinese roast duck. It was a really fatty one (dribble, slurp, smack). Ended up with just enough meat for our dinner. Now I’m having white chocolate and berry swirl ice cream with hot chocolate sauce because I figure I might as well go all the way. I can see why you’d eat the whole thing in one “standing” :) They look amazing! I have a vintage rotisserie (60’s?) that makes wonderful roast chicken. The key for me however is getting an organically raised bird from my farmer’s market vendor. Your typical US grocery store chicken has no flavor no matter how it is prepared. I’ll have to crank it up the next time we wander home for a few days…. the poulet rôti looks absolutely divine. like you, I don’t roast my own bird anymore, the market off at Iena in the 16th by the musée Guimet does very good spit roast chickens and so does rue de bellefeuille also in the 16th. It’s an easy dinner option for me every so often. talking about street food, I’ve been following Eating Asia, a blog by another American abroad, this time in SEAsia where street food is really the thing…. I like getting just the roasted legs which one places sells separate and the potatoes – mmmmm! When we visited Paris my husband would smuggle them into our hotel room where no food was allowed because they were our favorite meal in all of Paris. There is simply no equivalent here in the states. As much as I love your idea of a truck delivering hot, melty Comté tartines and croques monsieurs, be thankful that there are no food trucks in Paris. They’re great in theory, and they were great when there were, say, 6 or 8 tooling around the city. But now every sidewalk and street corner is covered with carts, trucks and food stations. It’s stinky, the sidewalks are greasy and there’s no room to actually walk. Lovely. Great pictures as always. Poulet roti was something I ate at least weekly during my time in France, whether from a brasserie, a cafe, or, of course a white paper bag from a market. Once, a friend and I had spent all of our daily budget and we walked by a storefront with dozens of gorgeous chickens rotating. The smell was tremendous and we were so upset that we repeatedly walked by it about ten times, just breathing in the smell and pretending we were eating it! Wow Dave……You’re killing me… I’m reading this post while eating a peanut butter and jelly sandwich.. While delicious in it’s own right, I’m now craving a rotisserie chicken… Luckily, here in New York, I can get it delivered and it should be here in about 10 minutes !!! I’ll tear into it ala David !!!! Oh beam me up Scotty , I want, I want, I WANT! But the *potatoes*!!! No mention of the potatoes…………………………… ???? David, you inspired me to BBQ a whole chicken. Was scalding hot here in the northeast US so I used your recipe and spatchcocked then cooked on the backyard grill. Delicious! We’ve found it pays to ask the locals who does the best roti when in the countryside at a marche. Not all roti are created equal. Same goes for the potatoes, and if you are lucky mushrooms and onions roasted in that fabulous schmaltz dripping off the bird. Hey Linda P. I am jealous that you were in Paris and spotted David. Hope to see you in French class in Sept! Just yesterday my DH said we have enough mileage points to finally visit France! 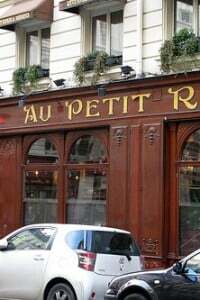 Thank you, David, for all your posts about dining in Paris. I never would have thought to buy street food, even in Paris (where I live now they are called “grease trucks,” and not affectionately either). I hope to spot you if/when we visit, but at most I will only smile and nod my head in recognition (can’t shed the New Yorker in me to invade your space). Between the photos and the descriptions, my mouth is watering now. I’m dying for such fabulous food. That rice looks killer, and the chicken unbeatable. I am very jealous cause I am here and you are there. in the end and for the same price i prefer a roasted poulet de Bresse from a rôtisserie rue de la Roquette. nothing beats a poulet de Bresse, with its white parts staying moist.